Video format: 1080p HD. Aspect 16:9. 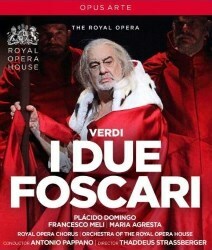 I due Foscari was Verdi's sixth opera. The composer had considered an opera based on Venice for his fifth work, scheduled for his debut at the Teatro La Fenice in the Winter season of 1844. However, Venice fostered its reputation of a festival city and was determined to conceal its darker side. Consequently, Verdi was warned off and instead set Ernani. For his Rome debut later that year, and after the censors had considered his first choice of subject as subversive, his thoughts returned to an opera set in Venice and in particular on Lord Byron's play The Two Foscari. With his innate feel for the stage he recognised that the play lacked the necessary theatrical element and instructed his librettist, Piave, to find content to add some grandeur. Set in Venice around 1457, the story of I due Foscari concerns the aged Doge, Francesco Foscari, who has made enemies in the all-powerful Council of Ten. His son Jacopo, has been charged and tortured on false accusation and sent to exile away from his wife and children. His wife pleads with his father, as Doge, to exercise clemency and allow his son to return to Venice. Francesco cannot usurp his judicial duty and his son is sentenced to further exile. As Loredano, an implacable enemy of the Foscari gloats, Francesco, as father, meets his son in prison. Jacopo is summoned to be told he is to be exiled again, with his wife and children forbidden to accompany him. In the final act, preceded by a regatta and festival, Jacopo is led to a boat for exile. Back in the Doge’s Palace his father reflects that the last of his three sons has been taken from him. A letter revealing Jacopo’s innocence arrives too late as the young man has died of grief. Bereft, Francesco then faces the ultimate insult of being forced to abdicate his position and Lucrezia returns to find him stripped of his crown and robes. He dies of grief. The costumes in this production are in period and the staging is largely traditional and without producer concept intrusions. These are significant virtues albeit there are some rather gruesome scenes of torture (CH. 14). The staged representations of a gondolier are imaginative (CH. 17-18, 25). The work does not lack dramatic situations and confrontations but Piave failed to provide the kind of choral scenes needed to stir the imagination or provide the grandeur that drew musical inspiration from Verdi in those earlier operas. Where it does score is in the confrontations and meetings between the Doge and his daughter-in-law such as conclude act one (CHs. 12-13). Such father-daughter duets are a mark of several Verdi operas and his facility in making the most of them is a hallmark of his compositional genius. They are often the vocal highlights of the opera concerned. Similarly, the duets between father and son, also present here, are the focus of Verdi’s creative genius. Whether or not this drawing out from Verdi is a subliminal consequence of the loss of his own children is a justifiable discussion. What is not in doubt in this performance is the weakening of their impact by Domingo’s inability to sound like a true Verdi baritone. To go further, there are times when he and Francesco Meli are singing in a scene when it is difficult to differentiate the characters by vocal tone alone (CH.20). Yes, Domingo brings committed acting to his portrayal, but ultimately he cannot and does not do justice to Verdi’s vocal demands in the way that Nucci does in the rival Blu-ray issue (review). The above criticism ultimately detracts from the overall impact and is a disservice to the other participants as well as the production. A pity, as the singing of Lucrezia Contarini as Jacopo’s wife, in her Royal Opera debut, is very good indeed. As for Francesco Meli as her husband, he is never less than acceptable, even if not erasing from memory some more notable Italian tenors of an earlier era who caressed a Verdian phrase with more meaning and elegance (CH. 27). Fearsome in his costumed appearance, singing and acting is Maurizio Muraro as the Doge’s implacable enemy Lorendano. It is regrettable that Verdi did not develop the part more extensively, perhaps influenced by the limitations of the bass available at the premiere. The performance of the Covent Garden Orchestra is outstanding directed by Pappano and taking strength from his dramatic vision. The Covent Garden Chorus make their usual competent contribution despite limited opportunities. I suppose it will be many years before the work is presented again in this theatre. With a genuine dramatic baritone in the title role and the likes of Pappano on the rostrum this staging could be a vehicle for the work’s renaissance. Meanwhile Plácido Domingo might serve his reputation better as a producer rather than as a wanna-be Verdi baritone. There appears to be an ever-increasing number of recordings where effortful singing takes him outside his natural fach.